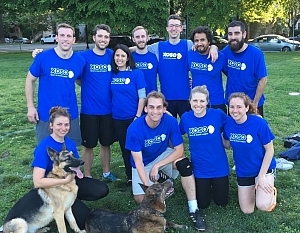 "OGDNB" is our Ultimate champion for the second straight season, sweeping the league with a perfect 8-0 record. All season "OGDNB" was the favorite to win it all and they didn't disappoint. For the second straight season they have ended the season as champs, this time thanks to a 13-8 over "Milk" in the final. It was a strong start to the season for our champs, taking down "Milk" in a low-scoring 11-7 win. From there our champs got even stronger, picking up wins of 7 or more points in four straight games. Each time it was "Milk" who was the greatest competition, but each time they fell short. Instead, our champs sweep the league with their perfect record, finishing with a +51 point differential in the process. The next closest team, which ended in 4th place, had a measly +4 differential. Talk about dominance! Congratulations to "OGDNB" on the perfect season, and we hope to see them again soon!